I have waited a long time to add this wonderful man to the website, 6 years, 2 months and 24 days to be exact. The reason I chose this number to honor him is because in 1858 a book titled A Brief Historical Sketch of the Life and Sufferings of Leonard Trask The Wonderful Invalid was printed and published by David Tucker. It eventually became the official first written documented case of Ankylosing Spondylitis in the United States of America. 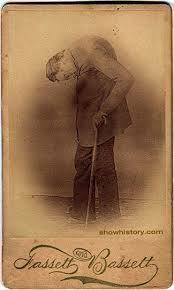 In my research about Ankylosing Spondylitis many years ago I came across the information about Mr. Trask who was called the Wonderful Invalid. I ordered his book and read it within an hour, a lifetime of suffering and devastation documented in 48 pages, it was both inspiring and heartbreaking to me. In 1858, David Tucker published a small booklet which clearly described a patient by the name of Leonard Trask who suffered from severe spinal deformity subsequent to AS.$$ In 1833 Trask fell from horse exacerbating the condition and resulting in severe deformity. Tucker reported that “it was not until he [Trask] had exercised for some time that he could perform any labor” and that “his neck and back have continued to curve drawing his head downward on his breast”, evidence of inflammatory disease characteristics of AS, and the hallmark of deforming injury in AS. This account became the first documented case of AS in the United States. I want to share a poem that Mr. Leonard wrote that was included in the book. Enjoying all the sweets of ever sense. My vision stinted, all my frame unsound. That my misfortune did you not befall. Though gold and riches lie not in your way. From the hale circle, and exchange with me? Tempt you to take my form, and aching head? Or all the wealth that reaped on India’s field? If not, reflect, how poor I am, indeed! Become like me, or all your wealth expel? You may appreciate what I have lost. Who, to your lot, has better fortune sent. I, still so many earthly blessings share. Such friendly treatment, too, where’er I go. To raise the object with a tender hand. How soon she melts at the scenes of bitter woe! The crystal fountain of hear heart, so flow. In crowded streets, and marked the silent tear. Her words unpleasant, never greet my ear. With minds and hearts, like little angels good. Their kindness, too, has oft my heart made glad. Such torture racked my mortal, shattered frame. I feel, at relaxation of my pain. And soothe my mind in dark adversity. In faith and hope, the future bright appears. Farewell: — and peace be with you evermore. Leonard Trask was born on June 20, 1805, in Hartford, Maine, the son of Osborn Trask, a prosperous farmer who taught his children to work diligently. Leonard learned his lessons well. As a teenager, Leonard worked on his father’s farm, but as a young adult he began his industrious activities. He moved to Carthage to make bricks at $11.50 a month. He returned to Hartford to build a stone wall 100 rods long in eight weeks for $100. With his earnings he bought a pair of oxen for $50 and sold them for $55. He went to Byron, Maine to work as a logger for $12 a month for 2 1/2 months, then on to Massachusetts where he worked as a logger for $13 a month for one year and $18 a month for the next year, always increasing his wages. Upon returning to Maine the next year, he bought a parcel of land on the west side of Worthley Pond in the town of Peru. He contracted someone to build him a barn one year and a house the following summer, where he and his bride, Eunice Knight, whom he married in 1830, settled down to raise a family. They lived well, enjoying prosperity and their children until 1833. One day when he was riding horseback, he encountered a hog that became frightened and rushed directly under the horse’s hoofs. The horse stumbled and plunged, throwing Mr. Trask directly over its head. Mr.Trask was thrown onto the ground, landing forcefully on his neck and shoulders. It was at least two months before he was able to do light work, and then only in great pain. He could work no more than an hour at a time before he needed to rest. The next year he improved, but his cattle suffered from a disease known as murrain, and his stock dwindled considerably. He was now no longer a prosperous farmer and needed to return to the hard labor of logging. The next winter he went with a crew of men to work at a location twelve miles into the woods from the nearest dwelling. They traveled through four feet of snow, but could not find the camp. They spent the next two nights out in the open around a campfire. They spent the third night on cots made from bows under a low shelter of trees before they found the camp. Because of this adventure, his spinal problems increased. He could not get off his bunk without the use of a rope to pull himself up. He ate his meals walking around a stump. Before his accident, Mr. Trask stood 6 feet, 1 inch tall and weighed 199 pounds. 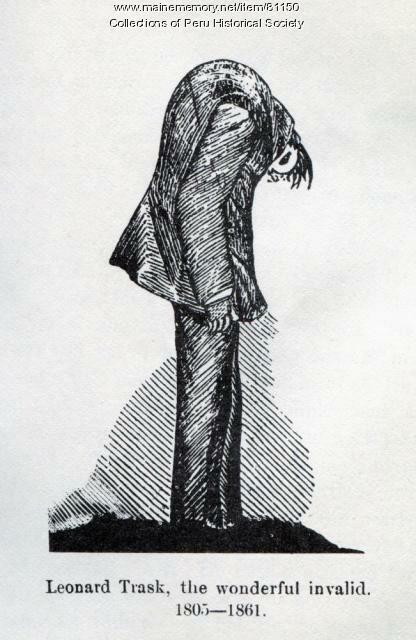 By 1835, two years after his accident, his neck and shoulders began curving forward. In 1840, he fell from a load of hay, breaking his collar bone and four ribs, which brought on a fever and further curving of his spine. One day a loud snapping noise came from his upper spine, caused by the separation of his neck and back, therefore causing further curving of his head forward and downward. In 1857, he measured 4 feet 10 1/2 inches tall at the highest point of his shoulders, and weighed 134 pounds. By this time the curvature of his spine was so pronounced that he was looking directly at his chest and could see no more than two or three feet in front of him without leaning back. Over the years he saw 21 physicians who dealt with all kinds of specialties. He endured all types of horrendous treatments, including blood-letting with blood suckers, and trying to stretch his body. He tried selling some of his homemade products, but gave it up because his appearance was so startling that he frightened women and children. Showmen wanted to hire him as a curiosity at their shows, but he refused. Even then he refused to become a pauper of the town. A historian, Sumner R. Newell, Esq., wrote a short book titled, A Brief Historical Sketch of the Life and Sufferings of Leonard Trask, the Wonderful Invalid. Trask went with his biographer to New York where they sold the booklets for fifteen cents each. The sight of Mr. Trask caused much curiosity, and they sold many of the booklets, but not enough to pay their expenses or produce much of a profit. According to Mr. Newell’s short biography of Mr. Trask, in 1858, while traveling by a coach that cornered too sharply, Leonard and his traveling companions were thrown about very roughly. He hit his head on a broken iron projection on the coach door, opening a five inch gash, with a piece of iron penetrating his skull. This further deformed his spine, pushing his chin into his chest, causing breathing problems. He was bedridden the last two weeks of his life and died in 1861. In 2011 one of the members of the Peru Historical Society received a telephone call from David Caldwell-Evans of London, requesting information about Leonard Trask. This information was sent to him. In February of 2013 a letter was received from Mr. Caldwell-Evans explaining his interest. He was once an athletic and muscular man—symmetrical in person—broad chest and shoulders—erect in form, and stately in his movements, presenting to the eye a picture of health and strength. That symmetry has now departed, those once powerful muscles have become feeble—that agile step falters—and a mere wreck is all that remains of the physical man! His extraordinary sufferings—his accidental deformity—his rigid spine, and bowed head—the result of injury and disease. An account of Trask’s condition, from the 1860 account in A Brief Historical Sketch of the Life and Sufferings of Leonard Trask, the Wonderful Invalid. Trask’s injury had further been exacerbated in 1840 when he fell into a load of hay, and in 1853 when he was thrown from his wagon, breaking his collar bone and four of his ribs. On May 24, 1858, he was involved in a third incident, where, while traveling in a coach which took a corner too sharply, he and a number of other passengers were thrown to the ground. Trask’s head impacted with an iron projection on the coach door, opening a wound “which parted the scalp, opening a gash in his head five inches long, and penetrating to the skull bone.” Despite the severity of the injury, which further deformed his spine, pushing his chin into his chest to the extent that it hampered breathing, and despite being told he would be dead by morning, Trask recovered and was able to walk again. I thank you kindly, sympathizing friends- Your favours, your kind patronage implore; On these alone my earthly weal depends- Farewell—and peace be with you evermore. Trask’s final message in his account, in the form of a poem address to the reader of A Brief Historical Sketch of the Life and Sufferings of Leonard Trask, the Wonderful Invalid. Trask was now severely disabled. His wife nursed him, as he was unable to navigate—not being able to see more than a short distance in front of him without leaning backwards. Trask thus sought to earn a living from his disability in order to sustain his wife and seven children. This included the production and sale of numerous documents and items which survive for historical analysis, including the self-published A Brief Historical Sketch of the Life and Sufferings of Leonard Trask, the Wonderful Invalid in 1860, for which Trask had traveled to Maine’s District Court to produce. It contains numerous accounts of Trask’s activities, such as “Mr. Trask in Pursuit of Fuel” and “Mr Trask at the Circus”. During all Trask is referred to as ‘Mr. T.’ His account became the first documented case of AS in the United States. “Leonard Trask: “The Wonderful Invalid””. Show History. Retrieved 2009-05-07. Jayson MI (March 2003). “Leonard Trask: the wonderful invalid: the first American description of ankylosing spondylitis”. Rheumatology. British Society for Rheumatology. 48 (3): 612–613. doi:10.1002/art.10875. PMID 12632411. “Life and sufferings of Leonard Trask” (PDF). Ankylosing Spondylitis Information Matrix. Curtis, Heather D. (2007). Faith in the Great Physician. Baltimore: Johns Hopkins University Press. ISBN 0-8018-8686-4. OCLC 85899018. Trask, Leonard (1858). A Brief Historical Sketch of the Life and Sufferings of Leonard Trask, the Wonderful Invalid. Portland, Maine: Tucker. OCLC 271223702. Williamson, Joseph (1896). A Bibliography of the State of Maine from the Earliest Period to 1891. Maine Historical Society. Portland, Maine: Thurston. OCLC 1720036. 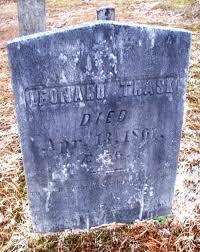 Gravetone of Leonard Trask in Oldham Cemetery in Peru, Oxford County, Maine. Thank you for being such an amazing testament of courage and grace in dealing with such a horrific disease during a time that allowed you no relief but pure determination to continue on. You are indeed a Wonderful Example… May you rest in peace. How great is it to discover the first documented case of AS. Thanks for your invaluable research and all the love,care and humanness you have given to those who also share it with you. WOW Cookie~this is an amazing example of grace and determination! I had seen pictures of Mr. T. but never knew of his journey. Thank you so much for all your research and your determination to give him his well deserved place and honor among your “Faces of AS”! You are a gift that I cherish every day. Learning from others on this page, reading their stories and knowing I am not a lone in this battle~ warms my heart! I wish you a great 2018 and hope that you will rest now that you’ve hit this incredible milestone! Thank you so much, isn’t he just such an inspiration? I can’t tell you how much posting his story has meant to me. Thank you for believing in me. Here is to 2018! Amazing that this is the first documented case in the Americas. Hard to believe there were not many others. I read his book a few years ago, when first diagnosed, it scared me, but I was at aww over his will to live. I found somewhere that AS was documented in Egyptian times. It’s amazing that it’s been around for eons and still not widely known.